Our last post on Things to do in Montreal was a little lightweight, so we’ve broken it up a bit and put in more effort to serve you up a list of local eats. By asking some of our local friends here about the best places to eat in Montreal, we ate our way around some of the restaurants that were recommended to us. Some are a bit touristy but others are not in the slightest. 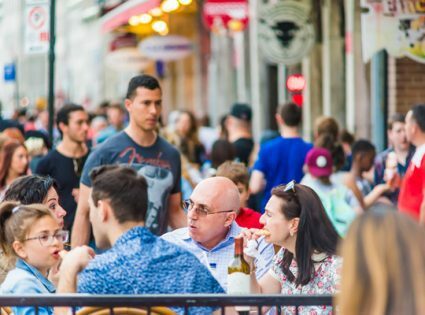 Overall it’s a great list of places to help others on their next galavant into this Parisian-style city (and supposedly one of the best places to eat in North America). On the main street of the Plateau lies a miniature replica of the food halls in Harrods and David Jones, Boulangerie Première Moisson. On display are handmade chocolates, freshly baked baguettes, specialty meats, and best of all, the pastries and sweet delights. Buy the almond and chocolate croissant, it’s like taking your taste buds to the spa. And conveniently across the road is the Second Cup, where I prefer a creamier coffee. Bagels in Montreal are an art form. And there are two famous bakeries where you can find these distinctive bagels, Fairmount and St Viateur. Try both the poppy and sesame seed with a good helping of Liberty cream cheese. For the sweet-tooths, there’s a cinnamon and raisin bagel that is delish when topped with cream cheese, sliced banana and a lather of honey. Or for the more adventurous, Fairmount themselves recommend a bagel with peanut butter and banana slices! The best (and worst) thing about these two establishments: they’re open 24 hours a day, 7 days a week. There’s always a line out the door at Olive et Gourmando. It’s a gorgeous little cafe/deli in the Old Montreal quarter (Quartier Vieux-Montréal). The atmosphere is electric and the food always delicious. Last time I visited, I had a hot panini with caramelized onion, fresh goat curd, and homemade ketchup. So yum! You’ll need to book in advance if you’re a party more than two, or at least get there before the crowds, which seem ever-present. Where I have yet to see the waiting line less than 10 people deep is Schwartz’s, the original, world-famous smoked meat and steakhouse. Rock legends and movie stars like Celine Dion, Angelina Jolie, and the Rolling Stones have all visited the deli for a meat fix. Vegetarians and vegans are warned, do not expect a meal here, or better yet, avoid it altogether. If only the Welcome music on their website kept repeating, I’d have it open all day long. This super cute, very French bistro, La Croissanterie Figaro, is open daily from 7 am to 1 am. A bottle of wine with a cheese plate on the terrasse on a Saturday night can’t be beaten. This Afghan restaurant piqued my interest as soon as I walked past on my very first day in the neighborhood. Not just because it’s BYO wine, or that I’ve never eaten in an Afghan restaurant before, but it looks and smells like a sauna! And so it quickly went to the top of my list of Things To Do in Montreal. The meals come in hefty proportions (especially if you decide to go all out with the degustation menu) so arrive with your stomach grumbling. Another bar/bistro that’s great for a wine or beer served with a light French meal of charcuterie is La Buvette Chez Simone. Our suggestion would be to order a bunch of things tapas style and sample sample sample. Goat cheese walnut salad is off the hook. Afterward, you can walk off that cheese with a hike up Mont Royal, or dance it up with the renowned Tam Tam hippies if you time your visit on a Sunday. Have you ever experienced total darkness? The type that visually impaired people must live with? Well, O’Noir can help you out there. It’s an experiential restaurant where you eat in complete darkness. Blind waiters serve you, blind musicians serenade you, and for those two or so hours, you are blind too. It’s well worth the ~$30 price for such an eye-opening experience (on that note, just relax your eyes, no matter how far you open them, you won’t see – you’ll just end up with eye cramps). Book a few days in advance though, because O’Noir is on everyone’s Things To Do in Montreal list (hot tip: there’s also one in Toronto). The Restaurant Leméac is best known for being the best late night value in town. The token Table d’hôte which includes an appetizer, main dish, and coffee, costs only $22 after 22h. If you’re a night owl like me, you’ll appreciate the availability of local dishes like escargots and duck confit late at night. Especially when served on the summer-loved terrace with a glass of wine. The unofficial regional dish of Quebec is poutine. It consists of frites (aka fries or chips), cheese curds and gravy. La Banquise is the quintessential Montreal poutine eatery. It’s in the middle of the Plateau, adjacent to Parc La Fontaine on Rue Rachel. They offer over 20 styles of poutine AND they’re open 24 hours, 7 days a week. That’s right, they’re open all the time. Let’s just hope we can exercise a modicum of moderation like the slim native Montrealers do. Pizzeria Napoletana in Little Italy, great wood fired oven thin crust pizza and BYO wine; Jano’s in Le Plateau, tasty affordable Portuguese chicken that’s great with the spicy sauce; Burritoville on Rue Bishop, big and cheap Mexican burritos, tacos and quesadillas (my favorite is the burrito with sweet potato); and Au Pied de Cochon is the only place on Avenue Duluth without BYO wine so it’s on the pricey side, famous for being one of Anthony Bourdain’s favorite restaurants, I’ve heard mainly rich reviews (not from vegetarians or people with special dietary needs though). A big thanks to Jeff and Mike for helping out with this extensive list of eateries frequented by locals. Let us know in the comments if you’ve been to any of the ones listed or think we’ve missed out anything très importante.